Cambodian seafood lunchbox: scallops, shrimp, mussels, squid, fried scrod, crabmeat, and seasoned ground chicken simmered in a savory, slightly spicy sauce with coconut milk. I actually had no idea what this dish would turn out to be like, but I wanted to get something that was seafood based. The menu doesn't list the fried scrod, but I found a big filet of it in my box haha. I nibbled on a little bit of it just to see what it tasted like, but set it aside. The rest of the dish was actually really fantastic. It was basically like seafood stewed in this Asian sauce that reminds me of a mix between pad thai sauce and thai chili sauce. 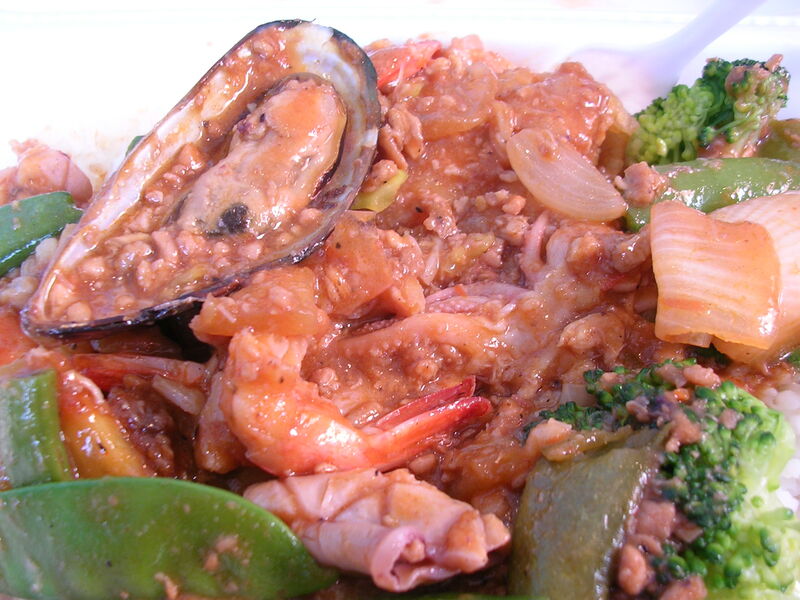 The ground chicken was in the stew also, and complemented the seafood quite nicely. I also had a small side of fresh mixed veggies on the side that helped cool off the slight heat from the dish. The lunchbox comes with a good deal of white rice that I didn't eat, but the seafood alone filled me up. So yummy! Had 3 cups of water with lunch (24 oz). Mediterranean chicken entree: 4 oz. 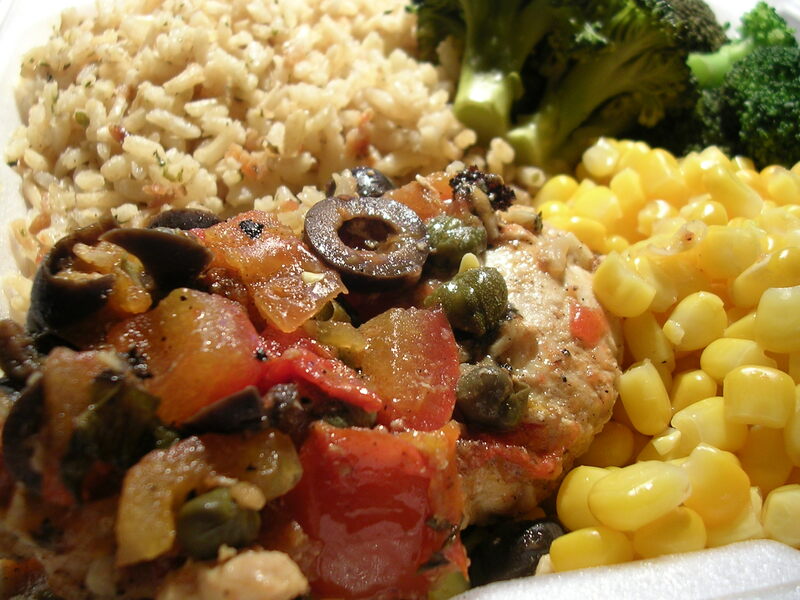 of chicken breast braised Mediterranean style with olives, capers, tomatoes, and basil. Came with a side of steamed corn, broccoli, and seasoned brown rice. I was pretty tempted to get other dishes for dinner, but it was the night before my senior ball, I had to hang in there and keep eating healthy. I was pleasantly surprised by the chicken entree though. I picked off all the olives and capers on top because I dislike the taste of them, but they did in fact impart an aroma on the chicken that was braised with them. And since the chicken was braised, it was quite moist and really delicious when paired with the brown rice and vegetables. The seasoned brown rice was much more tasty that usual, reminding me of rice pilaf almost. Even my boyfriend thought it was good, and he hates brown rice with a passion. I wonder what they seasoned it with to make it so palatable. Shared a Nalgene bottle of water (16 oz). This entry was posted on Tuesday, May 8th, 2007 at 5:09 am	and posted in beverages, Mediterranean, poultry, rice and pastas, seafood, Uncategorized, Vietnamese. You can follow any responses to this entry through the RSS 2.0 feed.